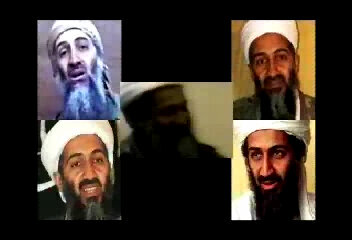 911blimp reveals: U.S. Confession Video shows FAKE Osama! Hear 2 guys talk about this video as if it was genuine! 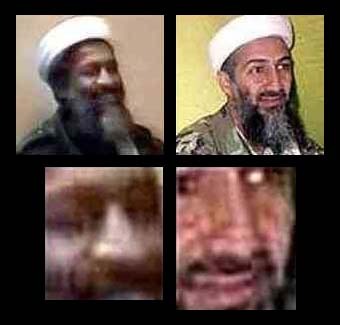 The only evidence we have that Osama bin Laden knew about 9/11 is a video "confession" which turns out to contain a fake Osama (in other words, a poor double)! That's right! The government's "proof" of "who dunnit" is all part of The Big Lie. We admit were skeptical when we first saw this evidence of video fakery appear on the internet. But in July 2004, Khaled al-Harbi, "an associate of Osama bin Laden", "surrendered" to authorities in Saudi Arabia (BBC CNN ABCau). This was trumpeted by the media as a victory in The War Against Terrorism, because al-Harbi had been seen seated next to "Osama" in the scene where "Osama" purportedly confessed (source) to having been in on the planning of an attack on the twin towers. That meant that the networks would re-air portions of the U.S. government's "confession" video and we could see for ourselves, direct from the corporate-run-government-controlled corporate media, if the confessor looked like Osama, or if some of the so-called conspiracy theory web sites were correct. Once again, our government was found to be deceiving us, and on an unimaginably huge scale. People can blame their ignorance on corrupt mass media, but not their apathy. If you know someone who still doesn't know about the lying government's fraudulent "confession" video, whose fault is that? Please share this web page with everyone you know.